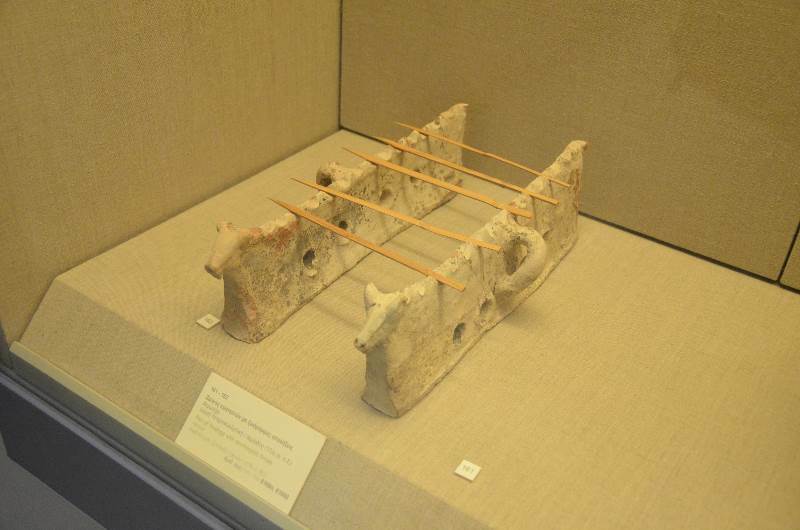 Until the 1960s, when Santorini finally acquired electricity, and well before the development of tourism and frequent, regular ferry connections between the Cyclades and Piraeus, all the islands (Santorini included) were obliged to be self-sufficient and their eating habits remained the same as they had been for centuries. They relied upon fishing, shooting migratory birds, animal breeding, and local products such as the tomato, caper and fava. 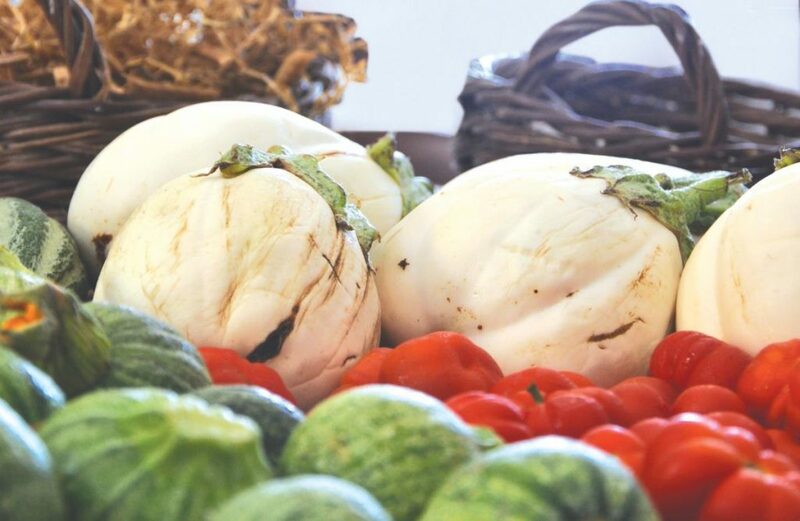 The volcanic soil was especially conducive to the raising of a special range of vegetables such as the white eggplant, liliputian zucchini, a kind of “waterless” cucumber called “antzouri,” and gave an intense flavor to anything that could survive there. Then commenced the battle for the preservation of foods for later use, through drying, curing, cheese making, rusk baking and tomato paste. At the same time, given these limited raw materials, housewives were hard pressed to these muster their imaginations to break the monotony and create the most flavorful combinations possible. Until this time, the diet of most of the residents consisted of barley bread or biscuits that were kneaded and baked once a month, for the only firewood came from vine prunings and fig trees. The basic pulse on the island is fava. 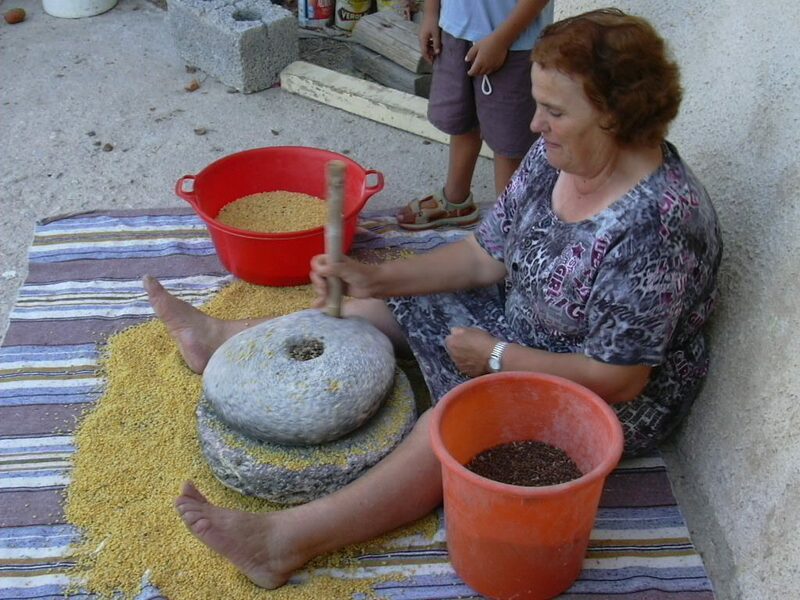 One reason for its cultivation over the beans or chickpeas found on the other Cyclades was that fava cooks far more quickly and did not consume much precious fire wood. 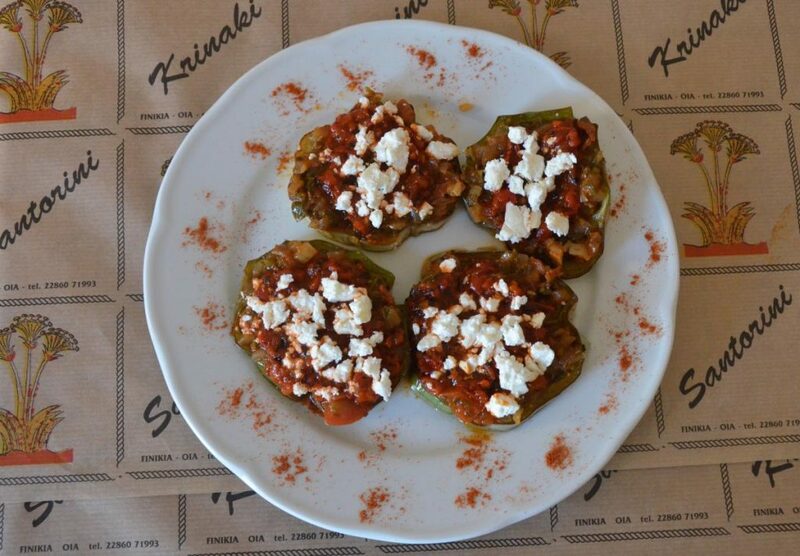 Despite the ostensible poverty of Santorini’s raw materials, its cuisine could not be tastier. Its fava is renowned and delicious in all its manifestations, there are delicate, light tomato and zucchini fritters, exquisite, tangy eggplant dip, succulent sun-dried tomatoes and tomato pastes, fried white eggplant (sweeter than the purpley ones), seafood, lountza (cured pork fillet) in vinsanto with sugar and fennel seed. 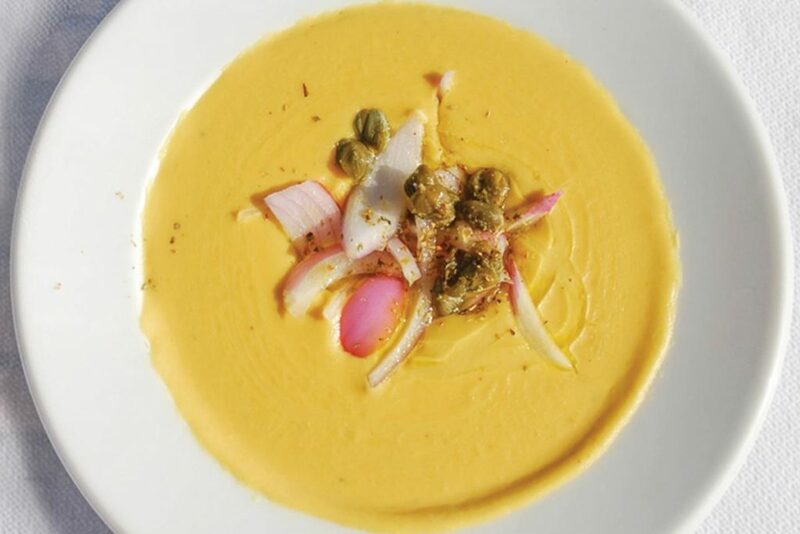 For those in the know, when we speak of contemporary creative local cooking or about haute cuisine on the islands, our minds go at once to Santorini. And from there to Giorgos Hatzigiannakis, the founder of the celebrated Selene restaurant, who from 1985 led the way – in words and in deeds – in the movement to develop local products and especially to promote their use by other professional restaurateurs and winemakers in collaborative endeavours aimed at showing off the dishes of Santorini. The spirit behind this reasoning gradually caught on, and after numerous individual and collective attempts – culminating in “The year of Santorini’s Gastronomy (2014)” – eventually produced the desired results. 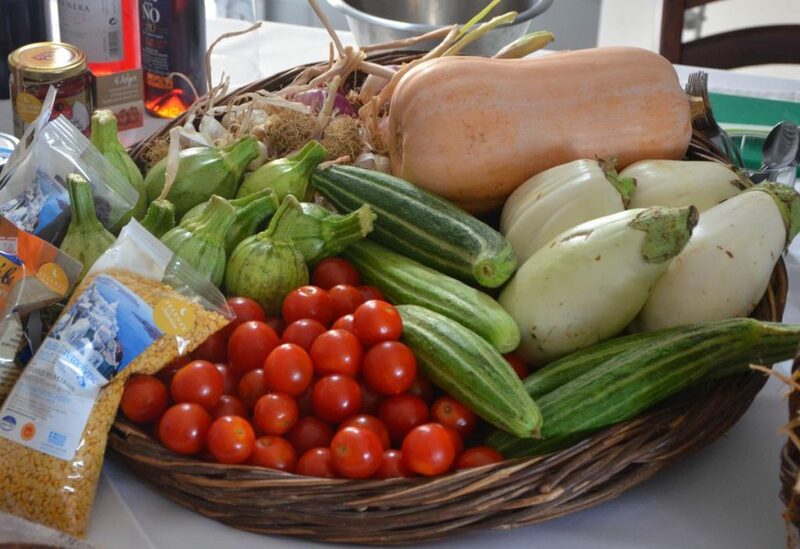 Today Santorini has become the ultimate gastronomic destination in the country. Unique agricultural products, pioneering restaurants with national and international awards, hospitable tavernas with local dishes, wineries that offer wonderful wine tastings and tours, special shops stocked with local products, cookery lessons, gastronomic sightseeing have all set the stage for a very special gexperience for food lovers. 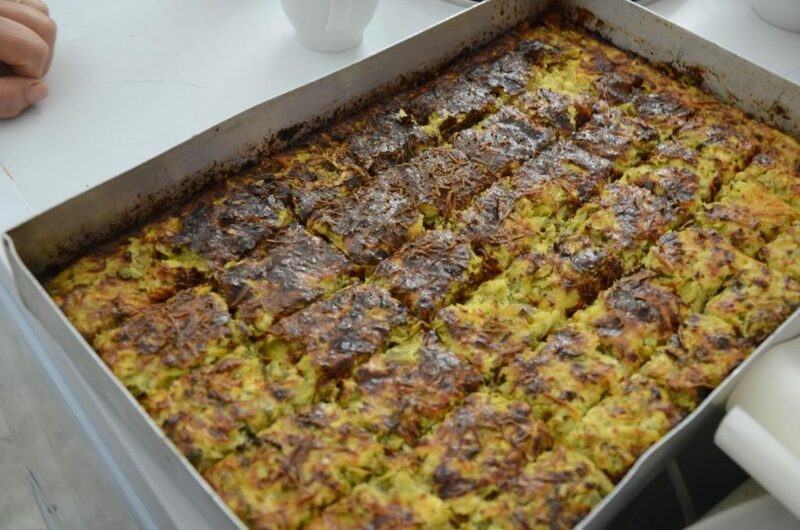 Atherinopita, a kind of “pie” made by frying tiny fish (like whitebait or smelt) with onions and flour. Aimatia, a kind of blood sausage stuffed with liver and rice. Apochti, Santorini cured pork. The haunch is salted and placed in vinegar before being air dried. It is rubbed with pepper, savoury and cinnamon. It’s similar to the apaki of Crete, the syglino of Mani, the noumboulo of Corfu, but unlike them it is not smoked, and therefore resembles more the air-dried louza of the other Cyclades. Kopania is an old-fashioned Santorini sweet that takes its name from the way it’s prepared. Barley rusks are pounded and mixed with raisins and sesame seeds and then rolled into little balls and sprinked with roasted sesame seeds. Kouneli tyravgoulo (literally cheese-egg rabbit): Pieces of rabbit fried with onion, garlic and flour and then braised with bay leaves, salt, wine and water. 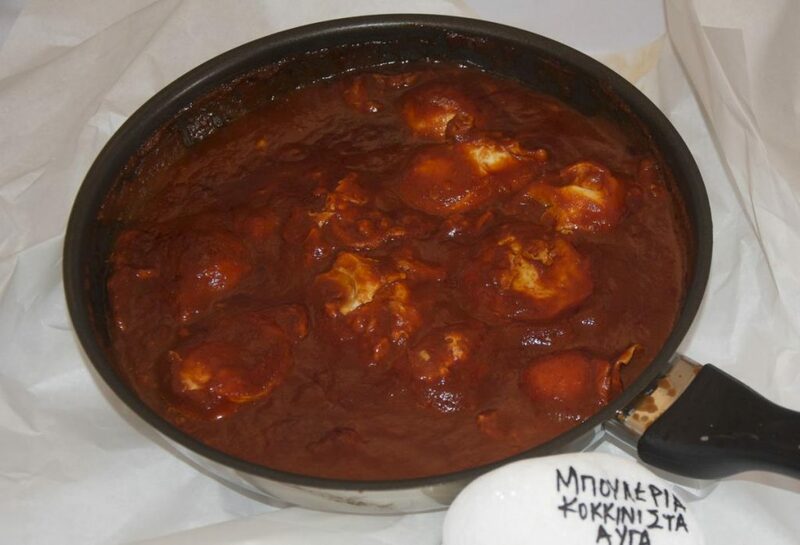 At the end it’s thickened with beaten eggs, grated kefalotyri cheese and wine. Koufeto: Honey boiled with toasted almonds, usually given away at weddings or other special events like shop openings. 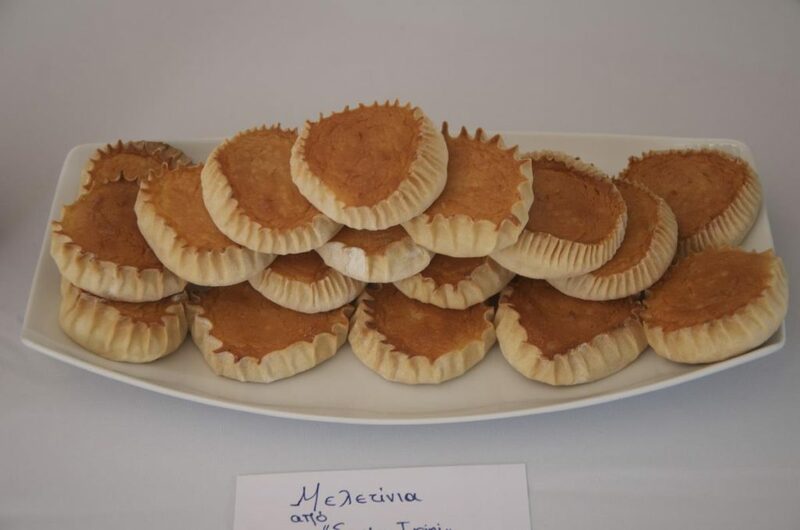 Meletinia: A traditional Easter sweet cheese pie in the shape of a disc, consisting of fresh Myzithra cheese, sugar, cinnamon and mastiha and pie dough. 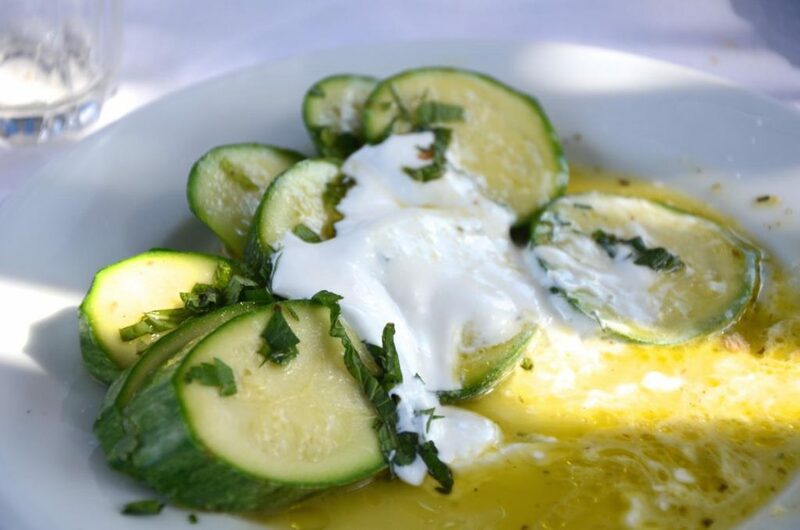 It appears in many shapes and slight filling variations from Crete to the Dodecanese. 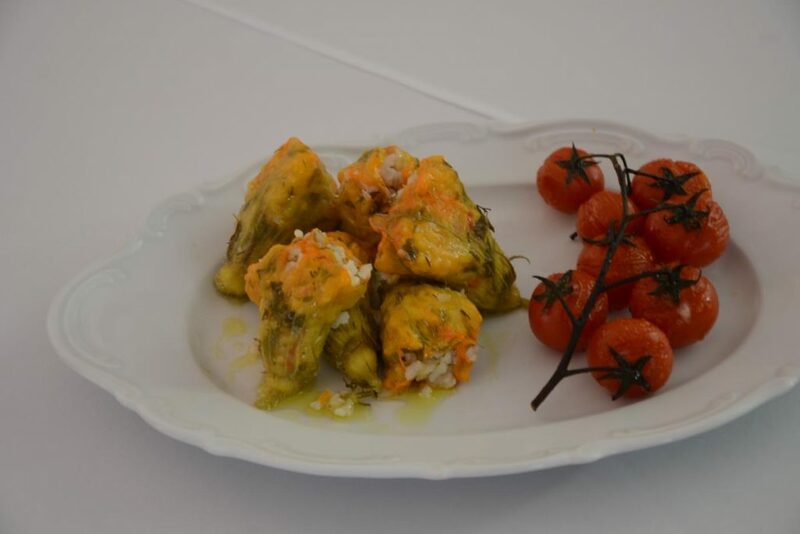 Xelouristos Cod, which is usually eaten uncooked, cut into small pieces with a tomato salad. Brandade of salt cod, in which the desalted pieces are fried and then sauced with a light skordalia (garlic sauce) mixed with tomato paste and baked in the oven for 10 minutes. 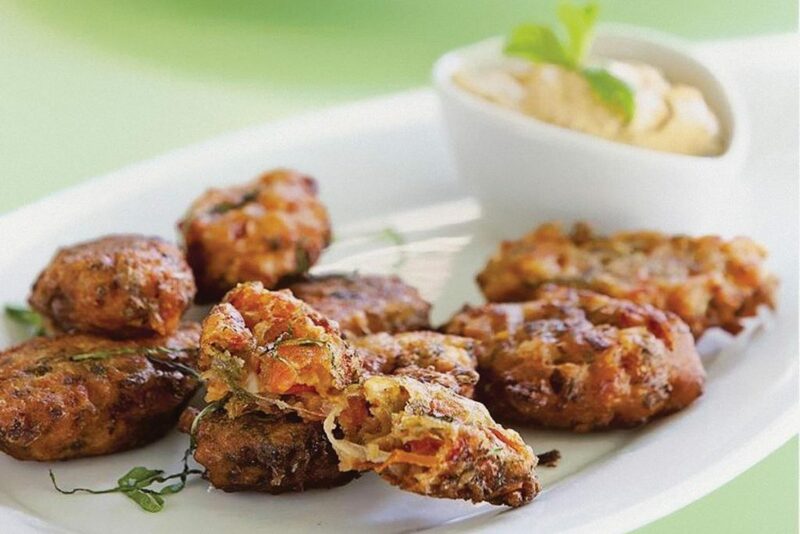 Ntomatokeftedes (Tomato fritters) . One of Santorini’s signature dishes and the most common of the “fake” (that means meatless) meatballs. 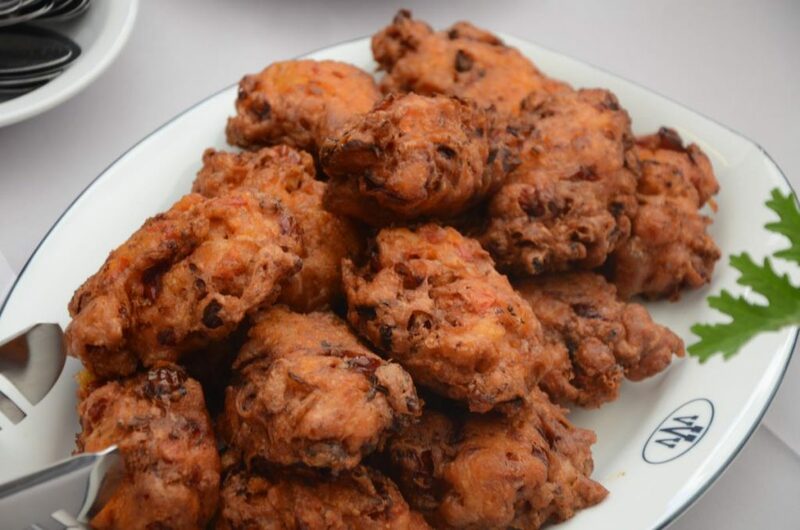 The fritter is made with the thick batter of Santorini tomatoes, onion, pepper, mint, oregano and flour, fried in hot oil. Poulia yemista (Stuffed “birds”): Courgette flowers, cleaned and stuffed with a filling of rice, onion, tomato, mint, grated courgette, parsley and spices. Santorini pudding: A dessert made of semolina and milk – the poor would make it with bread and milk, the rich would add eggs, semolina and chocolate. Served with a sauce using sweet Vinsanto wine. 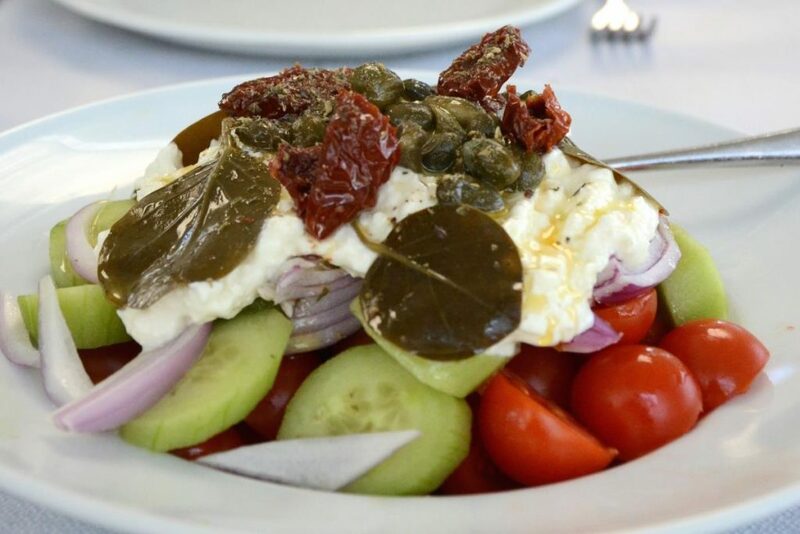 Santorini salad: Based on local products, including rusks, chlorotyri (fresh cheese), tomatoes, capers and caper leaves. Skordomakarona or thick spaghetti with browned garlic. A working class favorite. 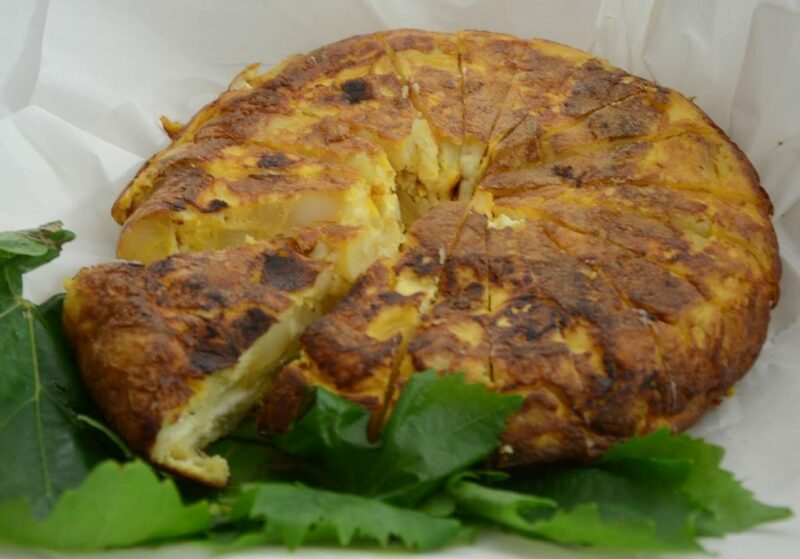 Sfoungato: A kind of omelet with courgettes, potatoes and tomatoes fried in olive oil. A Santorini classic. Marinated fish: Fried medium sized fish marinated in vinegar and rosemary, like the Corfiot savoro. Psarolia psita or sun-dried little fish: Dried for several days in the sun, they are usually eaten in winter and considered a good meze with wine. Pseftokeftedes (fake keftedes) or meatless meatballs : Besides the well known ntomatokeftedes, they can be made with almost any kind of greens or pulses. One of the favorites consists of chard, mint, tomato, courgettes and various other greens, tossed in a batter and then fried. Cucina Povera at its best. According to our sources, the food habits of the inhabitants of Santorini have adhered for 4,000 years to the famous trinity of Mediterranean cuisine: olive oil, wheat and wine. Information on the diet of the residents of prehistoric Thera comes from three sources. 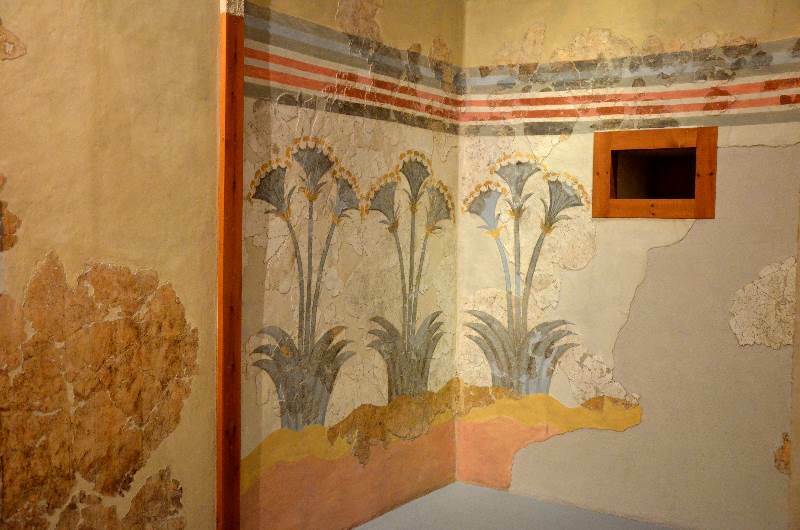 The first is the vase and wall paintings of the period. 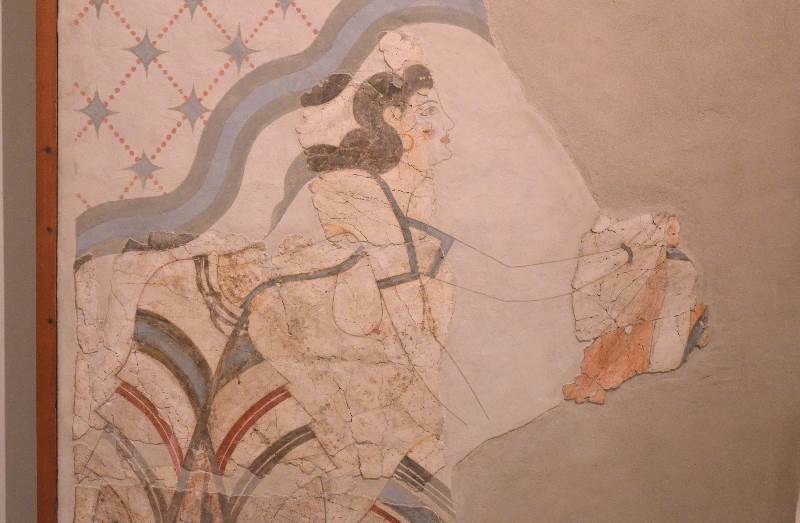 The exquisite frescoes of the Fishermen from the West House at Akrotiri, in which each depicts a young man holding two big bunches of fish tied with a string, a clear indication of the importance of fishing in those times. Primitive fishing activities are confirmed by the second source, which comprises archaeological finds like tridents, hooks and small pierced stones that served as weights. The abundance of vases and jars also testifies to the widespread consumption of wine and oil. 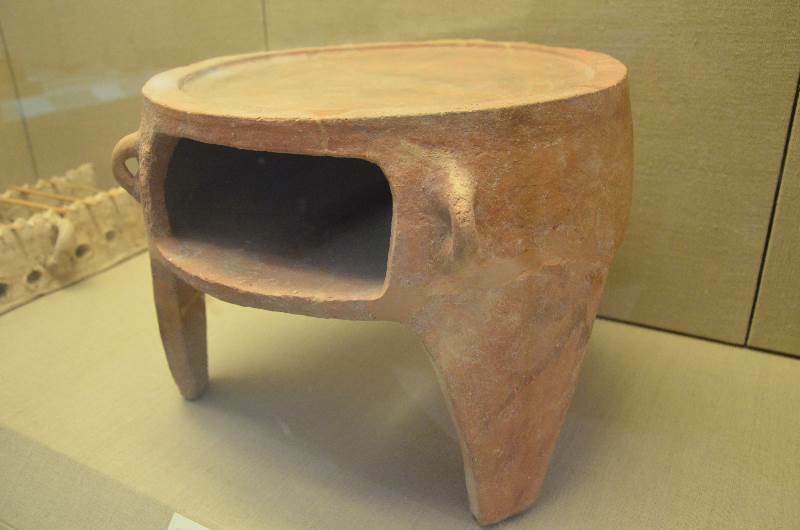 Two of the most interesting pieces of pottery in the Museum of Prehistoric Thera are an exceptionally elegant small charcoal burner and a base decorated on both sides which consisted of two tiles, which would be placed over hot coals and used to grill meat, possibly on skewers, the first souvlakia. 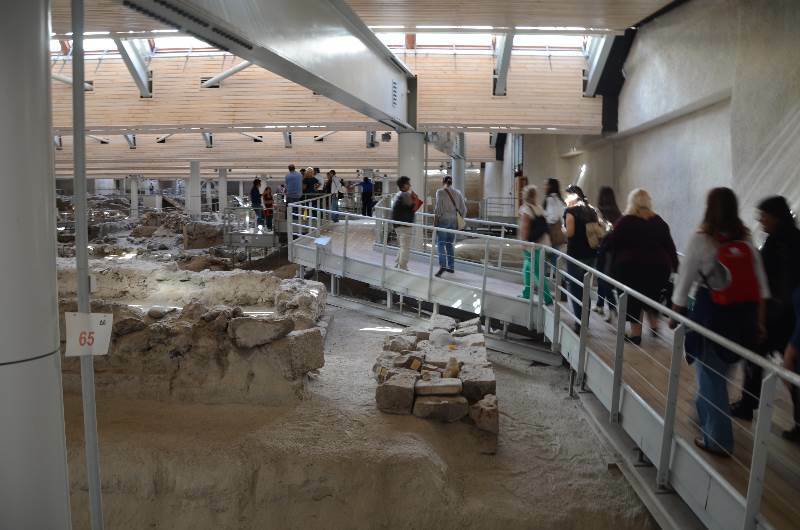 The third source is the remains of foods, the preserved waste, animal bones, seeds, plants. From these finds, researchers have been able to determine what types of fish were caught; it seems most of them were small fry. From the analysis of the animal bones found we know that the islanders raised goats, sheep, pigs, cattle and that the hunters among them were able to catch hare, deer and birds. We also know that the residents of prehistoric Thera, apart from fish and meat, dined on pomegranates, figs, almonds, olives, oil and pulses, quinces, sea urchins, scallops and limpets. Moreover, another famous fresco from Akrotiri, the Saffron Gatherers, shows barefoot female figures are collecting stamens from the island’s wild crocuses on a steep hillside. Saffron was used as a dye more than a flavoring and its rarity caused it to become a symbol of wealth and power.